Campervan conversions often lack amenities like a hot shower. There are a few reasons for this, mainly the lack of space – but also because many people don’t know that heated portable showers are an option. Propane powered camping showers have been around for quite some time. They are simple, portable setups that you can take anywhere and run off a standard 1lb. propane canister. Portable camping showers are great choices if you plan to spend a lot of time off grid. In this article we discuss how to set it up, what to look for when purchasing a heated portable shower, and some of the most popular brands. Read our complimentary articles on how to find showers when living in a van, and how to build a tankless water heater into your campervan. Water heaters can be either fully portable or fixed. 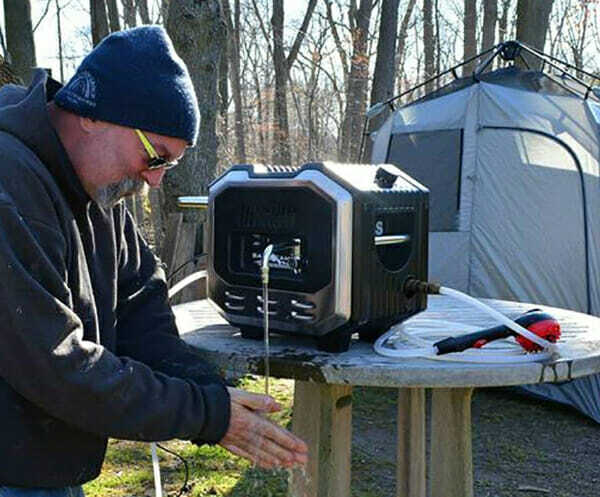 The biggest difference between portable camping heaters and permanently attached tankless heaters is that portable heaters come with their own water pump. As the name implies, they are fully mobile and designed around standard 1lb propane canisters. These heaters are essentially a shower in a box for camping so they require minimal setup and no external plumbing to work. You can store this heater safely under your bed, on a shelf or in a trunk. When it’s time for a shower: pull it out, connect the propane canister, place the pump in your water source and plug it in. Then you’ve got an instant hot water shower! Because these heaters have a built in pump, it means they can’t be easily incorporated into a pre-existing sink system. If you want a built in hot water sink in addition to a shower, you’ll be better off looking into permanently mounted water heaters. Another upside to these portable versions is they can more easily heat water run through the system twice (making for a truly hot flow from cold water). Portable water heaters are all designed to fit a 1 lb propane canister, but the connection is a standard size so you can buy an adapter hose to fit a lager propane tank if you desire. This type of heater makes for great outdoor showers but they should not be exposed to the elements when idle. You don’t want permanently attach them to the outside of the vehicle where they can be exposed to rain or snow. All decent portable water heaters come with a tip over kill-switch that turns the unit off if it tilts past a certain angle to prevent dangerous operation. They also include an automatic ignition that is triggered when the unit is on and water is flowing. For units that are powered directly by a 12V source, the propane ignition is triggered by separate batteries. Because these heaters come with pumps and more hardware, they are more expensive than their fixed counterparts for the rated BTU output. Water heaters need fresh oxygen because they’re burning propane. Give them plenty of ventilation and never use a propane water heater inside a closed vehicle! Remember, if you’re using soap, to wash far away from streams and lakes. Even biodegradable soap has properties that wreak havoc on water ecosystems. It is fine to use in the woods where it can be filtered through soil. This is the amount of water that the included pump can deliver. It is measured in GMP, or Gallons Per Minute. The higher the flow rate, the more water pressure you will have in your shower head or sink. Some pumps come with an adjustable flow rate. Keep in mind that there’s an inverse relation between the flow rate an the temperature: the slower your flow rate, the hotter your water will be. A BTU, short for “British Thermal Unit”, is a measure of how much heat is given off over a period of time. In general a higher BTU rating means you’ll get hotter water for a given flow rate. Most units come with a temperature adjustment that increases or decreases the flow of propane, which raises and lowers the BTU output. Portable heaters require power for their pumps. Some need D-Cell batteries, some have an internal rechargeable battery and some need a direct 12V source from a cigarette plug. This is the average amount that the heater will increase the water temperature. For instance, if a heater has a 40 degree temperature rise and your have 60 degree water, it will increase that temperature to 100 degrees. If your water starts out particularly cold, you can pre-heat it (either on a stove or in the heater itself) before the final pass through the heater. Even with 45 degree water you can get a scalding 120 degree shower when you pre-heat it. Most units come with a max temperature for scald protection and to reduce the potential for the unit to overheat. For reference, the average recommended temperature for a household shower is 110 degrees. At 125 degrees it takes less than two minutes for serious burns to occur. If a unit is battery powered, this is the amount of time that the pump will be able to provide pressure until it needs new batteries or battery charge. Dimensions 12.5x7.5x12" 19.25x7.5x12" 19.5x10.5x13" 13x10x11.5"
The Mr. Heater BOSS XCW20 is the most premium heater of the Mr. Buddy series and has the most extra features of all the models we’ve reviewed. With a digital temp readout and battery level indicator, it’s great for gearheads who like to analyze data. This model heats up to 18,000 BTU and can flow at up to 1.18 GPM for a pretty decent outdoor shower. For reference, a home shower averages at 2.1GPM. The Heater BOSS will raise water temperatures 45°F above baseline, and maxes out at a safe 125°F. This heater comes with a built-in rechargeable battery which powers the pump for up to 40 minutes of run time. That means you can use it while plugged into a 12V system, or charge it up ahead of time then use it unplugged. It comes with a DC charger that can re-charge the 5Ah battery in 4–6 hours from a cigarette lighter. This unit can be plugged in while you’re using it, but the batteries will only charge when the pump isn’t running. The XCW20 model comes with a quick-disconnect shower head that attaches to the built-in faucet. This shower head has an on/off nozzle meaning that you don’t have to flip a switch on the main body every time you want the flow of water to stop. It features an electric piezo ignition that lights the flame when it senses water flow through the unit. The lithium battery is accessible, which means if you’re skilled enough it is replaceable. The downside to this system is that if the battery becomes damaged or dysfunctional from misuse replacing it is more complicated than just throwing in some new D cell batteries. Finally, the XCW20 model also includes a lot of built in electronics and cool readings on it’s control panel. You’ll get temperature settings, battery level, over-temp indicator, outlet indicator, water inlet temperature, burner on indicator water outlet temperature. Another convenient portable water heater is the Costway Propane Gas Portable Instant Hot Water Heater. It is a Chinese brand that comes with a nice price tag for the performance, and is received well in the reviews. The main difference between the Costaway model and the Mr. Heater models is that it does not use a battery powered pump. Instead, it plugs directly into a 12V cigarette socket in your campervan. The upside to this is that it makes the unit inexpensive and simple. The downside is that it must be located near a 12V power source to run. Like the Mr. Heater XCW20, it has max heat output of 18,000 BTU. Combine this with a 0.8 GPM flow rate and you get a pretty substantial temperature rise. It doesn’t come with an official temperature rise rating, but reviewers are seeing easily 40°F above the baseline temp. This Costway heater is great bang for your buck with solid features that won’t break the bank. Undoubtedly one of the most popular propane brands, Mr. Heater is well established and has many robust products on the market, and water heaters are no exception. Their entry level water heater, the BOSS XB13 Battery Operated Shower System, is a D Cell battery powered ultra mobile system. It skimps on everything except the necessities and comes in at a very approachable price. There is no sink faucet on this model. Just a hose attachment with a shower head. The water flow is a constant 0.6 gallons per minute and is turned on by a switch on the body. Because there is no flow control on the shower head, you must hit that switch when you want the water to turn on or off. The 12,000 BTU max output is enough to heat 0.6 GPM of water to 35°F above baseline and will max out at 125°F to prevent instant scalding. The XB13 is completely charged by six D-cell batteries. This means that you don’t need any kind of charging system that plugs into your vehicle. But you must replace the batteries once they’re run down, which happens at a claimed 30 minutes of pumping water. The silver lining of this is that if you’re camping deep in the woods, you just need another pack of batteries and you’re set for another round of showers without having to charge the unit using a car. For a portable system, it’s extremely light at 14 lbs. and is great for occasional outings with minimal fuss. It can also double as a home shower backup during power outages for those who aren’t living in their van full time. A cross between the Mr. Heater BOSS XB13 and the advanced XCW20 system is the Mr. Heater BOSS XW18. This heater comes with a built-in rechargeable battery with up to 40 minutes of run time. The XW18 comes with a built-in sink faucet and a quick-disconnect shower heat made to attach to the faucet. This means that you get flow control for the sink or shower head features. Like the XB13, the only way to turn the flow of water on and off is using the switch on the body of the unit. This means that when you’re showering, if you want to stop to lather soap, you need have quick access to the unit to do so. Unlike the XCW20 there is no control panel on this model. You’ll have to monitor the temperature and battery life by feel. Luckily the unit is well constructed and operates with fewer parts so there will be less to worry about over time. We think a heated portable shower is one of the most versatile and simplest ways to stay clean on the road. These units operate as plug-n-play systems that are easy to store and safe to use. They do not require a ton of battery power and can operate with your van’s cigarette lighter. In fact, the Heater BOSS XB18 can run entirely off D-cell batteries purchased at Walmart. Thank you for all the info on portable showers. I know it takes your time and energy to do this so a big THANK YOU from brandy and Joe in Washington state. We are life change wandering on YouTube.